In the previous stories, I mentioned that my old Pietenpol, N-1777W was built in the Hickam AFB hobby shop in the mid 1960s. 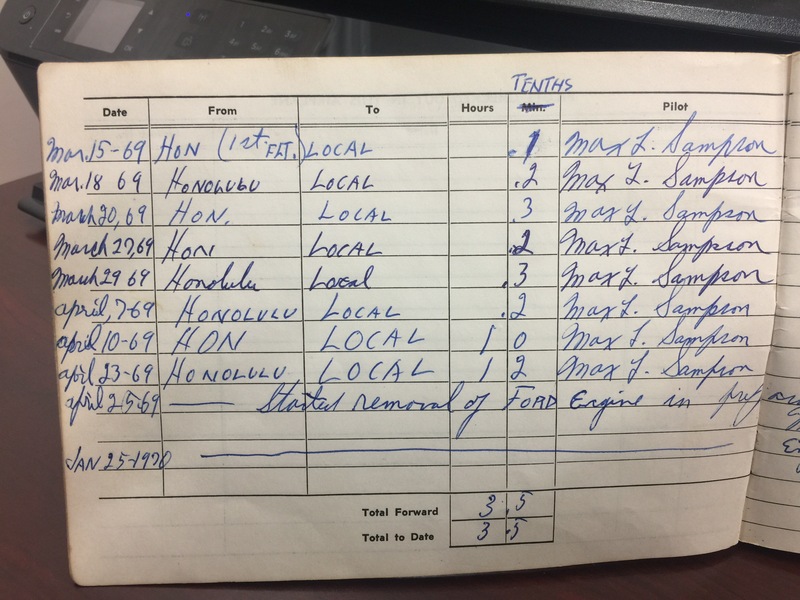 Below is a look at the first page of the log book #1. Plenty of things have changed in the last 38 years of aviation, and I trust that making test flights in a Pietenpol out of Honolulu International is not likely to be repeated today. Above, a look at the logs. The plane flew it’s first 3.5 hours on a Ford model B, and then this was removed and replaced with a Corvair. The plane flew nearly 100 hours in the fist months of 1970, area flights between Honolulu and Dillingham. In the spring of that year, it was packed up and shipped to Torrance CA, and from there flown to the first Oshkosh. One Response to Pietenpol first flight; Honolulu International.